Here's something you probably thought you'd never hear; the dude who made Super Troopers and Super Troopers 2 might wind up making a Marvel movie. Jay Chandrasekhar, head of the comedy troupe known as Broken Lizard, recently took a general meeting with Marvel Studios. That doesn't necessarily mean he's definitely going to make a movie with them, but it does mean that Kevin Feige and Co. have some interest in working with him and possibly the Broken Lizard gang. The question now becomes, what could this project possibly be? Jay Chandrasekhar is coming off of the success of Super Troopers 2, the long-awaited sequel to their original cult comedy classic. While the movie hasn't done much for critics, considering its low cost, its done reasonably well at the box office. Enough so that Marvel wanted to meet with him to see what characters from their catalog he might be interested. Or what characters his son is interested in. Here's what he had to say about it in a recent interview. "They sent me the Marvel Encyclopedia and they said, what do you guys want to do? So, it's upstairs. My kid's going through it. And he's going to make a list of what he thinks we should do, and I'll go through it. I'm curious to see what a 13-year-old's mind comes up with." There are a few interesting things there. For one, allowing a 13-year-old to sort of see what he might be interested in shows what kind of guy Jay Chandrasekhar is. In the same interview, he admits he was more of an Archie fan as opposed to a Marvel fan. There's also the bit where he says "you guys." Does that mean this would be a Broken Lizard project and not just him directing? It's also interesting that, despite the image of Marvel Studios having everything mapped out entirely, they're willing to just see what a filmmaker might be interested in doing and possibly fit something in their universe around that idea. Chandrasekhar also talked about that element, but also talked a bit about both the limitations and possibilities of something like this. "Yeah. Which is massive. And there are certain ones that are owned by Fox, so you can't do those. But there are plenty of people there, I mean, look at Deadpool. You're like, well I didn't know you could do that. Great. Let's do something like that. Right?" The director added the encyclopedia "arrived a few days ago" and that "We just had a general meeting. I'm sure I'm not the only one." That's probably true, as Marvel is likely meeting with filmmakers to start putting together their Phase 4 slate, which will take place after Avengers 4. 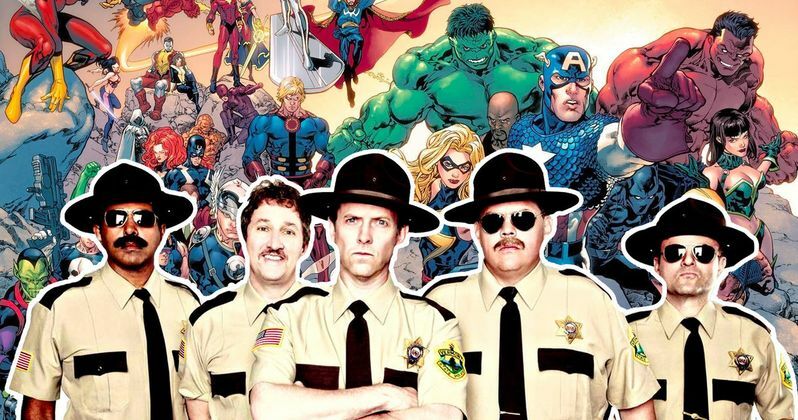 Still, we can't rule out the possibility of the Super Troopers gang bringing their brand of shenanigans to the MCU. This news comes to us courtesy of SyFy Wire.